Goat coats are necessary if you live in an area that gets cold during the winter months. This winter strap-on blanket can keep your goat warm, happy and fit. Goat coats are a must for our goats in Alaska. Many folks outfit their goat with a coat to preserve that show look and others just like to "dress" their goat up a bit. That's OK. There are many websites that will show you how to make your own, but that usually involves some sewing, not my strength. 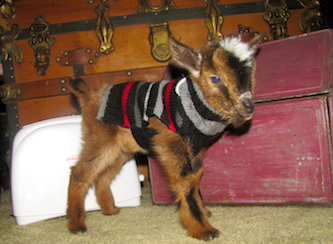 Below is a tiny goat coat made from an extra large, colorful sock. I made that, not too difficult. The best way is to buy a quality coat that will not allow your goat to tie itself into a knot. I prefer Amigo Goat Blanket/Coat, proudly modeled by the goats pictured.